All ministerial careers end in failure, but they start in hope. True, not everyone expects to end up in No. 10, but everyone wants to do something important. Politics has all sorts of downsides as a career choice but the fortunate few get the opportunity to do something meaningful – prevent or win wars, reduce poverty, create the NHS or, just sometimes, put an end to real injustice. 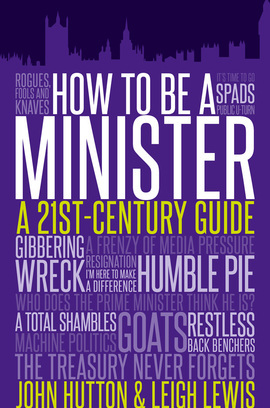 How to Be a Minister launches you into your fledgling ministerial career and shows you how to proceed. This is a fail-safe guide to how to survive as a Secretary of State in Her Majesty’s Government, from dealing with civil servants, Cabinet colleagues, the opposition and the media, to coping with the bad times whilst managing the good (and how to resign with a modicum of dignity intact when it all inevitably falls apart). Co-written by former Labour minister John Hutton and former Permanent Secretary Sir Leigh Lewis, How to Be a Minister is not only an invaluable survival guide for ambitious MPs but a tantalising view into the working lives of the people we elect to run our country. John Hutton and Leigh Lewis do an excellent job in their new version of How to be a Minister... Part I is a vivid description and a valuable guide to the plethora of factors which help or hinder ministers ... Rookie shadow cabinet ministers are pretty busy at the moment. However, if I were you, I would put this on your Christmas list. It could come in useful for next May. A must for ambitious thrusters in the Conservative Parliamentary Party 2010 intake. For anyone who wants to know how government really works, this book is a must.